Well, it seems as though the “C” posts for this year’s PBP have a song and chant theme. First it was on carmina, and, now, the Camenae. The Camenae are a group of deities, four in number: they are Antevorta/Prorsa, Postvorta, Carmenta, and Egeria. These are native Italic deities, but later Roman authors identified them with the Muses due to their function of inspiration and poetry. They preside over childbirth, prophecy, and women, and are said to favor springs, rivers, wells, and fountains. Antevorta/Prorsa is concerned with two things: aiding in the delivery of children born head-first, and she is also a goddess of the future. She is quite possibly an epithet or a function of Carmenta, though in later times she became her own deity. Postvorta is, like Antevorta, concerned with the position of the child in childbirth: though where Antevorta aids with children born head-first, Postvorta deals with children born feet-first. She is also a goddess of the past. And, like Antevorta, she is quite possibly an epithet or a function of Carmenta, though in later times she became her own deity. Carmenta – sometimes called Carmentis – is a patroness of women, and her function is inspired speech – or prophecy. To her also falls a function of childbirth. She has her own festival, the Carmentalia, which takes place on the 11th and the 15th of January. She is also called Nicostrate, the mother of Evander – Evander being an exile from Arcadia who founded the city of Pallantium, which was situated right on the future site of the city of Rome. Bona Dea is one of those deities of whom we know very little; this is because she was the major deity for a women-only mystery cult, and while people wrote down many speculations, we have no insider stories, as it were. One of the things that we do not know is her true name. That’s right – Bona Dea is not a name: it’s actually a title, meaning “The Good Goddess”. Plenty of other Roman deities are known by titles instead of names, including Bonus Eventus (Good Fortune/Outcome), and Bonus/Bona is often used as an epithet for, well, pretty much all deities. Anyway. One of the more popular theories as to her identity is that she is Fauna, the wife (and daughter!) of the seer-deity Faunus. Another couple of theories put out by ancient authors is that she is the wife and sister of Faunus, or that her name is not Fauna but instead Fenta Fatua, with Fatua for foretelling women their fates, as Faunus did for men. In any case, it is speculated that her true name was forbidden for men to speak, and since the women of her cult didn’t write it down, we don’t know what it is. We do, however, know some things about the cult and mysteries of Bona Dea. It was apparently similar in nature to the Orphic Mysteries, thought what that means, exactly, I don’t know. No myrtle was allowed in her cult areas, and there’s a little myth that goes along with the reason: taking the perspective that Bona Dea is Fauna, wife of Faunus. Faunus found out that she had been drinking wine in secret – a huge taboo in ancient Roman society – and, in a rage, he beat her to death with sticks of myrtle. This is also why wine, although used in rituals in her honor, was called “milk”. It seems that wine or mead and cakes were the most popular offering to Bona Dea, and purple – unsurprisingly – was her sacred color. We know that her sacred groves were decorated with purple ribbons and garlands, and apparently her priestesses wore purple ribbons in their hair. Sacrifices in honor of Bona Dea were called damium, which comes from a Greek word meaning “public”. Obviously, however, those sacrifices were private, so there’s an interesting use of word there. Along with that, a priestess of Bona Dea was called a damiatrix. Another myth of this goddess says that she is merely the daughter (not wife) of Faunus, and that she refused to be in the company of men due to her “great chastity”. That, the myth says, is why men aren’t allowed to participate in her mysteries. Just because men didn’t participate in her mysteries, didn’t mean that they didn’t worship the goddess. We actually have a ton of evidence, mostly in the form of dedicated altars, that men were devotees of Bona Dea. And they were men of different statuses, too, from freedmen to high-ranking Romans. brings me to the great “Bona Dea Scandal” of 62 BCE. There were a couple of festivals each year in honor of Bona Dea, but the one that concerns us here is the Winter rite. The festival of this particular year was held by Pompeia, the wife of Julius Caesar. As I’ve said before, but will re-emphasize here: MEN WERE NOT ALLOWED TO PARTICIPATE IN THE MYSTERIES OF BONA DEA. They weren’t even able to be in the same residence that a mystery festival was taking place in. It was said that she would blind the man who looked upon her sacred rites. But on this particular day, a young cad by the name of Publius Clodius Pulcher (Clodius the Beautiful, lol) dressed up as a woman and intruded upon the rites, fully intending to seduce Pompeia. Needless to say, things didn’t end well. Clodius was caught red-handed and charged with desecration of religious rites. His sentence was execution, though a friend of his – Crassus – managed to bribe the jury into an acquittal. Julius Caesar divorced Pompeia, famously remarking that “Caesar’s wife must be above suspicion”. In iconography, Bona Dea is depicted as holding a cornucopia in her left hand and an offering dish in her right. Oftentimes a snake accompanies her, and it is shown drinking out of the dish. She is also associated with a good amount of other deities: Silvanus, Hercules, Sabazius, Caelestis, Vesta, Mercurius, Panthaeus, Diana, Juno, and Fortuna Conservatrix. EDIT: Oops! I forgot to add the book that I got my info from. It’s a fantastic book for anyone interested in the cult of Bona Dea, though, be warned, it is very much a scholarly work. It’s got 577 pages, with 57 pages/plates of pictures, 5 maps, and long lists of inscriptions. It’s called “Bona Dea: the sources and a description of the cult”, by H. H. J. Brouwer. Published in 1989 in New York by Leiden publishers. I’m sure you guys all know how many deities are in the Roman pantheon. I’ve probably mentioned that a good few times. And how there are a metric tonne of different groups, each overseeing different functions. I’ve probably mentioned a couple of those, as well: The Big 12, the Hidden Deities, the Lares…etc. This post is on deities associated with agriculture. Agriculture was and still is incredibly important, and yet I don’t often appreciate those deities who preside over that field nearly as much as I should. Hence this post as both a learning lesson and a sort of way for me to get closer. So. Prepare yourselves. Names are coming. 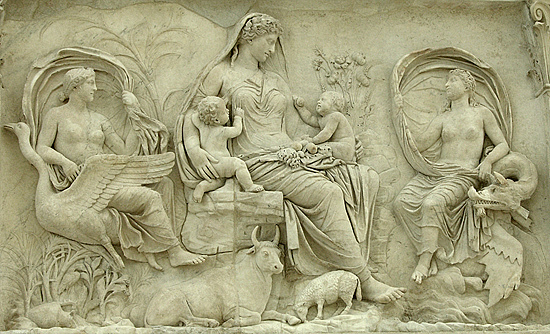 Probably the most recognizable of the Roman agricultural deities are Ceres and Tellus. Ceres is also a deity said to have given mankind laws, and is quite possibly a kind of psychopomp, but that’s another story. Tellus I wrote an earlier PBP post on, which you can find here: she’s essentially the Mother Earth figure, quite literally seen in her later Latin name Terra Mater. Along with these deities are whole other bunch who don’t accompany Ceres. There is Rusina, a goddess who protects fields; Rusor and Altor, gods who nourish plants and make them grow; Sator, a sower god invoked in the Carmen Saliare; Seia, a goddess who protects sown seeds; Segesta, who makes those seeds grow; Messia, the female equivalent of Messor; Noduterensis, god of threshing; and more. Other fairly-well known deities include Flora, goddess of flowers, and Venus, goddess of, not love, but fertility and the growth of fruit. There is also Sterculinus, god of manure. Poor guy; what a job. So I am being obliging and putting in a mention of Pomona and Vortumnus. This couple is amazing, and Vortumnus is hilarious. There is a myth centering around the two of them which I’ll have to write up someday – it’s one of my favorites. Pomona is the goddess of gardens and fruit trees, Vortumnus the god of seasons, change, plant growth, and gardens and fruit trees. I’m kind of excited to start this round of the Pagan Blog Project, which will, for me, be starting along with the actual schedule. I’m not going to re-use or re-post anything that I used for 2012’s sporadic PBP; instead, you guys can expect a completely new set of alphabetic entries. WOO. Thus, the agricultural-centered post will be next week. …Unless I think of another topic in the meantime. Anyway, moving on. Anna Perenna is, as I somewhat said before, a deity entirely concerned with the start of a new year and making sure that that new year is a healthy, productive one. People would, according to the ancient author Macrobius, give her offerings and pray “ut annare perennareque commode liceat“, which, roughly translated, means “so that it is possible that the circle of the year be happily completed.” Sounds like a nice way to start the year. Her festival on which people would ask this, however, was not on January 1st. Hell, it wasn’t even in the month of January. Instead, it took place on March 15. Which is an odd date for this sort of thing if you aren’t familiar with the archaic Roman calendar. For the early, early Romans, January was not the first month of the new year: that title fell instead to the month of, you guessed it, March. Or, rather, what we call March today. The reason for this is that the Romans, a warmongering bunch of agriculturalists, put warring and farming together: March was the month in which the first war campaigning and crop planting would have taken place, so they put great importance on it and made it the first month of the year. Furthermore, the festival was held on the first full moon, or the Ides, of March – an important date in any month. So, with all that down, who exactly is Anna Perenna? First, he says that Anna Perenna is the same Anna who appears in the Aeneid: Anna, the sister of Dido queen of Carthage. After Dido’s death, Carthage was attacked by the Numidians, and Anna escaped the city and fled away by ship. In a cruel twist of fate, the ship was driven by the winds right to Lavinium, the settlement which Aeneas had founded in Italy. Aeneas, ever a stranger to common sense, invited Anna to stay with him: Lavinia, Aeneas’ wife, didn’t like that too much. Anna had a dream in which she was visited by her sister Dido and warned that Lavinia was planning to get rid of Anna – and not in a good way. Anna took heed of her sister’s warning and, for the second time in this story, fled: but, unfortunately, she fell into the river Numicus and drowned. Aeneas and some of his men tracked Anna’s trail to the Numicus, where her ghostly form appeared to them and told them that she was now a river nymph dwelling in the “perennial stream” of the Numicus, and that her name was now Anna Perenna. The second story that Ovid gives is his own belief that during the first secession of the plebeians (in which the plebs went on strike and left the city of Rome en masse), those plebeians who had left the city ended up on the Mons Sacer (Sacred Mountain). There they ran short of food: but Anna Perenna, an old woman from the suburb of Bovillae, baked cakes and brought them to the plebeians every morning. When the strike ended, they set up an image and instituted a cult for the woman who had helped them. The third and final story is also my favorite of the three. Ovid writes that not long after Anna Perenna became a goddess, Mars Gradivus attempted to get her to persuade Minerva to become his consort. The wily old woman agrees, and goes off to do so. However. She didn’t really try to persuade Minerva. Nope. it was not the face of Minerva that he saw, but the old, wrinkled face of Anna Perenna. Mars was pretty pissed off, and Anna laughed at him with crude jokes and songs. And that, Ovid says, is why, on Anna Perenna’s festival day, people sang coarse and rowdy songs and told crude jokes. When I say “Unknown Deities”, I’m talking about three different things: first, those deities whose names are known but whose functions and attributes have been lost; second, those deities to whom temples and altars were dedicated, even though the dedicator didn’t have any idea to whom s/he was giving the offering; and third, the “Hidden Gods”, the Dii involuti. The first category is what Varro called the Dii incerti, or “deities whose function is unknown”. Probably the most well-known example of this type is Furrina: not only did she have her own festival, the Furrinalia, but she also was assigned her own Flamen – so she was a very important deity to the early Romans. And, unfortunately, all we know besides this is that she had a sacred spring in Rome. We have no idea what people would have given her offerings or prayed to her for. The next category doesn’t really have a name. These are deities whose functions are known, but whose name is not. So, for an example, take the deity Aius Locutius – the Spoken Voice. Warning – detour for history ahead! According to legend, in about 391 BCE a Roman plebeian by the name of Marcus Caedicius heard a voice that had called out to him from an area near the temple of Vesta. The voice warned him that the Gauls were marching south, and that the Romans should prepare themselves for an attack. Caedicius immediately went to the tribunes to warn them. However, because he was a plebeian – and one who had reportedly fallen on hard times – his warning was ignored. In another city outside of Rome the Gauls met with Roman ambassadors to make peace terms – but the Romans, a group of three hot-headed young brothers, violated the oath of neutrality they had taken as ambassadors: the oldest brother, Quintus Fabius, killed one of the Gauls. After several more slights, the Gauls decided to march on Rome. They succeeded in capturing the city, and the remaining Roman citizens (some had fled earlier) barred themselves behind a blockade on the Capitoline Hill. After a long time, during which many of the Gauls had died due to poor hygiene and unsanitary conditions, an exiled Roman general by the name of Marcus Furius Camillus received a message that he was needed to save Rome. He arrived in Rome during an infamous negotiation, in which the Gallic chieftain Brennus was cheating the Romans out of their gold (the Romans had agreed to pay Brennus 1,000 pounds of gold to get him and his Gauls outside the city, but Brennus was using heavier weights in order to procure more gold). Camillus threw his sword down upon the weights, yelling either “vae victis!” (“Woe to the vanquished”), or “It is not gold, but steel that will redeem the native land!” In any case, the Romans won the day and the Gauls went back to the Apennines. Anyway. The Romans, deeply embarrassed that a voice had warned them but they had paid no heed, built a temple to that voice. But they didn’t know which deity had warned them, and didn’t want to offend any gods by dedicating a temple to the wrong one, so they dedicated the temple to the anonymous Aius Locutius. Another aspect of this category is used in both ancient and modern worship. If a deity helps you, and you don’t know which deity it was (having not asked for help from a specific deity), offerings are commonly given with the expression “Si deus, si dea”, which means “if god or goddess”. Just to be on the safe side. The final category is one that I’ve touched on previously, though only briefly. This is the category of the Dii involuti, the Hidden Gods. These deities are above even Iuppiter – in fact, under certain circumstances, he must gain their approval before undertaking a task or throwing a certain type of thunderbolt. They are supposedly hidden behind the clouds, and no cult has every been ascribed to them. It is speculated that the Di involuti include the Fates (the Fata) or gods of favor. However, no one really knows who they are – not even their number, gender, or forms. Tellus, known as Terra Mater (literally “Mother Earth”) in the Imperial age, is the principle goddess who is associated with earth, i.e. the ground. Fitting since her name comes from the Latin noun tellus, which means earth, land, or territory. Originally, Tellus received homage in the early Republic and was listed by the antiquarian Varro as one of the 20 Di selecti, the main deities of ancient Rome. By the time that Imperial Rome came around, she was commonly known as Terra Mater. Her attributes are the cornucopia – a sign of plenty and bountiful harvests, which makes sense as she is a deity of the earth – and bunches of flowers and fruits. She is usually depicted reclining on the ground. Tellus, the central figure in this panel from the Ara Pacis. Photo courtesy vroma. Most often she is paired with Caelus, the sky, though Tellumo is recorded by St. Augustine as being her male counterpart. She is also associated with Ceres, goddess of grain, agriculture, and fertility (among other things). In fact, both goddesses share several festivals: the Sementivae, and the Fordicidia, which takes place during the Cerealia (a festival dedicated to Ceres). Tellus did not have her own priest: instead, public offerings were given to her by the Flamen Cerealis, the priest of Ceres. She did, however, have her own temple, which was located in the Carinae neighborhood on the Oppian Hill and dedicated on December 13th, 268 BCE. According to Cicero, within the temple was stored an object called the magmentarium, as well as a representation of Italy which hung on a wall. Did the Romans “steal” the Greek gods? This post…I have typed and retyped it over and over again, and it still doesn’t seem quite right. But I’m rolling with it. If there is one sure-fire way to raise the hackles of a Roman Reconstructionist, it is to state that the Romans stole the Greek gods for their own use and gave them Roman names, because, before the Greeks, they had no pantheon of their own. Every once in a while I’ll come across a post on a forum that suggests this. And then I fly into a frenzy worthy of the Bacchantes. Well, not really. But I do get a little peeved. Oh no, I thought. Are they asking what I think they’re asking? This is kind of a problem, and is widely thought to be the truth. I mean, it is what is taught in schools nowadays. How many times have your teachers or professors used Roman and Greek deities’ names interchangeably, saying in one sentence that “Aphrodite did this”, and then in the next sentence saying “Venus did this”? Or even blatantly telling students that the Romans stole the Greek gods, and then give a list of Greek and Roman deities as exact equivalents of one another? I’m going to come out right now and say that this is more than a little irritating. I know, I know, it shouldn’t be – honestly, people are not at fault for going on assumptions that they’re taught in school, or that most people wouldn’t give a second glance at after learning. But it still bothers me, nonetheless. But this post isn’t a rant. See, the Romans never stole gods. They weren’t godless heathens running around the lands waging war on everyone in sight – well, the war part, yeah, but they had their own gods, long before they came into contact with the Greek pantheon. I’m not trying to say that they didn’t take any Greek gods, or ascribe to their own gods the myths of the Greeks. The Roman Apollo is very clearly the Greek god Apollon, Aesculapius is Asklepios, and, in my opinion, the Roman Bacchus is the Greek Dionysos. Though I know others have their own UPG that states that Bacchus and Dionysos are different deities, and I totally respect that. And you know what? The pattern continues. Semo Sancus and Quirinus were originally Sabine deities. Angitia was Oscan. Feronia was Umbrian. But the Greeks are a special case, because it’s only the Greeks and Romans that anyone ever learns about in classics courses in school, and they are taught that the Greeks came first and the Romans were so unimaginative that they had to steal everything from them. When the Romans came into contact with the Greeks, they adopted the myths of the Greeks and some of the attributes of the Greek deities and attached them to their own (by this time fully Roman) Roman deities. This was called syncretization, and it was done so that the Romans could understand the deities of other peoples. As an example, Venus was originally a goddess of fertility – the only deity of love was Amor, the personified Love. Some people like to say that the Romans did, in fact, copy other deities – but then so did the Greeks. And every other culture since the days of the single, Indo-European culture and religion of waaaaaaay back when. Zeus and Iuppiter seem to come from the word “Dyeus”, or “Diu-Piter”, which was apparently an Indo-European deity. But the point is, the Romans never stole the Greek gods and gave them Roman names. And I wish more people knew this.